Meet the Trijicon Electro Optics IR PATROL M250XR Thermal Weapon Sight – a compact yet powerful scope designed specifically for tactical situations. 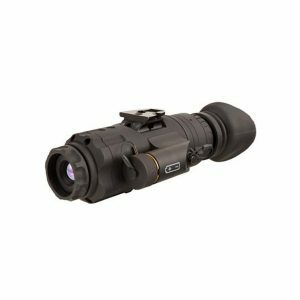 Trijicon Electro Optics manufactures these Thermal Imaging Scopes from 6061 Aircraft-grade aluminum and uses nitrogen purging for waterproof function. The Trijicon Electro Optics IR PATROL M250XR Thermal Scope has intuitive, ergonomic controls to put advanced IR technology and 4.5 to 8x magnification in the palm of your hand. Designed as a monocular for scanning all IR PATROL models feature Edge Detect Tactical Mode. This is an entirely new way to view your target with more precision. Edge Detect Mode is a fraction of the brightness of other modes so your eyes are not as prone to night blindness from the screen. The IR-PATROL comes with an easy-to-control polarity mode that lets you switch between three levels of white hot and three levels of black hot. Why limit yourself to one setting? With low, medium and high levels, you can pick your perfect mode. Fully ruggedized, weatherproof, multi-directional thumb stick control comes standard. Unlike most conventional buttons, the IR-PATROL controls are large and easy to find in complete darkness.